The modern ensign features a Scottish crown and the initials for the old Department of Agriculture and Fisheries, Scotland (DAFS). The new name is Department for Rural Affairs, but the flag has not been updated. The badge is described in Carr (1961) as, "... a foul anchor, the anchor on yellow and the cable in black, between the initials in white 'S F'. The Royal Crown in full colour is placed above, and the design is completed by a wreath of thistles in yellow." The ensign is now used by two agencies of the Scottish Executive Rural Affairs Department, the Scottish Fisheries Protection Agency and the Fisheries Research Service. The badge was not matriculated by Lord Lyon until 1988. The crown on the badge, being the Scottish Crown, has raised arches. I work for in the maritime operations section of Marine Scotland, a directorate of the Scottish Government previously called the Scottish Fisheries Protection Agency. I noticed that the current ensign on the Flags of the World website differs from the one flown by our vessels. I have a photo online at https://picasaweb.google.com/108451753250798302542/Minna2012#5768402419964133698 but it's not very clear so I've attached a photo of a wall plaque I have. The flag in [Liam Mason's] photo is the 'former' Scottish Fisheries ensign - or rather 'former former' ensign, since the crown on the flag is neither the Scottish Crown nor the St. Edward's Crown of England, but the Imperial State Crown as used on British emblems before 1952! For details of the Scottish crown, see this page. This image is based on the illustration in the 1915 edition of the Admiralty Flag Book. The design is correct but the colours are wrong. The Scottish Fisheries Board was established in 1882 and the Blue Ensign with this badge granted 26 March 1885. The original drawing was lost. In 1923 it was pointed out that the ground should be blue, the letters F B white, the thistle and anchor yellow, and the crown yellow and red. In 1924, Amendment 7, authorised by NL5304/23 was supposed to correct the mistake but had green thistles with white seed. Another amendment was issued, publicised in Admiralty Fleet Order of 3 April 1925 stating that the wreath of thistles should be yellow. Public Record Office ADM 1/8685/156. The illustration here came from a set of old encyclopædia flag drawings dated 1888. I'm not sure which encyclopædia set they come from as I have only the pages. The printer and date are printed below in what must be a half-point font. The only personal liberty I took with this drawing was to make the flowered ends lavender as they show up in the thistles on the Rhodesian shield. Otherwise, I drew the emblem up exactly as it appears. coloured illustration in the back of Longueville's book. The 1889 edition of the Admiralty Flag Book shows a white background, crown in full colour above a yellow anchor, fouled with black chain, green thistles with white petals, initials F B in green with diagonal hatching. The 1907 and 1915 editions show the same except that the bulbous part of the thistle flower is yellow, hatched grey, and the initials F B are yellow with diagonal hatching. In the 1930 edition it shows a blue background, yellow thistle with white petals. Initials F B now white but still with diagonal hatching. The black chain fouling the anchor unchanged, so that with a blue background it is invisible except where it crosses the anchor. It would appear that in about 1950, the Fishery Board for Scotland, became the Scottish Home Department Fisheries Division, and the initials on the badge changed from F B to S F . The first is in Campbell and Evans' Book of Flags 1950 edition, and the second in the 1953 edition. There are incorrect drawings of the first badge in the 1889, 1907 and 1915 editions of the Admiralty Flag Book. 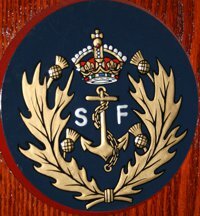 The crown on the SF badge it is a Scottish Crown, which looks similar to a Tudor Crown. In the British Admiralty flag book of 1889, Plate 22, the blue ensign defacement of the Fishery Board for Scotland is shown. David Prothero points out that the colours are incorrect: The vegetation should be yellow instead of green and the background should be blue. In other words, the badge is not on a white circle, but is placed directly on to the fly of the British blue ensign. Furthermore, the letters FB should be in white as opposed to green as shown in the book. The mistake, as David points out, was identified after the 1916 publication and was supposed to be corrected in the 1925 amendment, but this failed to materialise and an erroneous drawing persisted. Presumably, the colours should always have been those mentioned in the correction notice and so, the 1885 Admiralty flag book was also inaccurate? I have re-drawn the defacement from that edition with the colour corrections described. This detail has a Victorian-style crown, which was changed to Tudor. You could say that I am 124 years late I suppose.